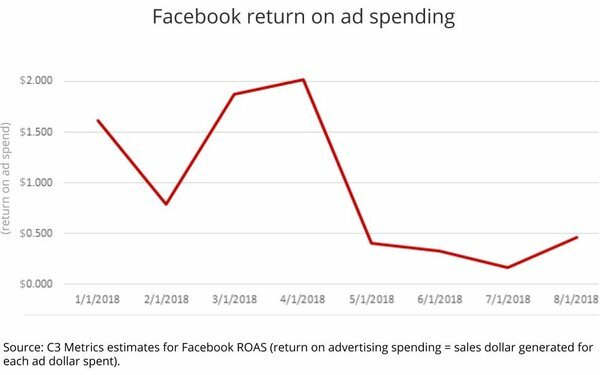 Ad spending on Facebook has rebounded from the crash it experienced following its Cambridge Analytica revelations, but the return advertisers are getting from it has not, according to an exclusive analysis by marketing attribution firm C3 Metrics. 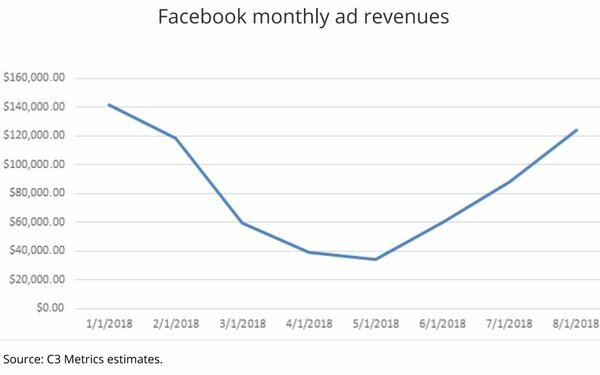 The analysis shows that while Facebook’s monthly ad revenue volume has returned to its post CA highs, the average dollar returned per ad dollar invested remains about a quarter of what it was prior to the crash. "Because of the advertising data scandal surrounding Cambridge Analytica and Facebook's own TV campaign highlighting it's error, consumers are far more suspicious of brands advertising on Facebook than ever,” explaisn C3 Metrics COO Jeff Greenfield, adding that the resumption of increased ad spending coupled with greater “competition for eyeballs” and a lower overall ad load in Facebook’s feeds, has led to a lower return on advertising investment. “Advertisers are no longer seeing the ROI from Facebook they once enjoyed,” Greenfield concludes.